A BBC radio show compiled a list of the 100 most powerful women in Britain, and—surprise, surprise!—the Queen is NUMBER ONE! WOOOOOOOOO!!!!!!!!!! San Dimas High School Football Rules!!! She commands obedience only from her staff and her corgis, but Queen Elizabeth II has been named Britain's most powerful woman by a BBC radio program. The list was dominated by business leaders and politicians. Home Secretary Theresa May - Britain's interior minister - ranked second, followed by Ana Botin, chief executive of Santander U.K. bank. So...the most powerful woman in Britain is a symbolic figurehead with no actual power? How empowering! Of course, everyone knows that by royal decree you have to give the queen 1st prize, or else you wake up to Sir Ilyn Payne creepin' out of your closet and offing with your head. 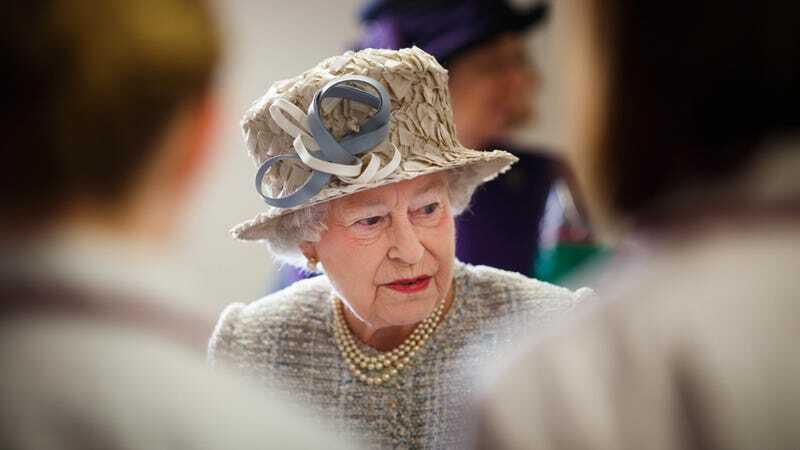 Other things in England that the queen is best at: croquet, high-jump, Mario Kart, Sexiest Man Alive, World's Greatest Grandpa, hot-dog-eating, being a woman made out of playing cards for some reason, and throwing. It's like an entire system of government based on that episode of 30 Rock where Grizz and Dot Com let Tracy think he's really good at Halo.